If this isn't the biggest share of the season, it's pretty close. Shain headed back to work this week. I miss him already. Not just because of his help with the harvest. Not because he sometimes has lunch ready for me when I come in from work. Not because he takes care of so many small details so I can focus on managing the harvesting and workshares. We are a team running this farm and it's hard with out him here. Most of all, I miss seeing him throughout the day and his random acts of kindness he does to make my day go a little better. It's been absolutely busy here lately. We've crammed a lot of end of summer activities into these past two weeks and have been away from the farm for several weekends in a row. I'm ready to stay home for a while. We start a new harvest schedule this week, which includes harvesting some crops on Saturday. This will help ease the workload on our other work days. A few new crops are ready to harvest and will be in the shares soon. We are starting to watch night time temperatures and taking precautions with the forecast looks threatening. It's hard to believe we could be getting frosts already. A mighty fine haul of veggies again this week. We are at the height of the season and the farm is producing more food than we can keep up with. Sometimes we have to decide what not to harvest based on our limitations of time and help. A good dilemma to be in. We hope you are enjoying the abundance. If you have any great recipes, please share. 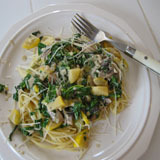 Shain is learning to cook vegan/vegetarian as part of our new, healthier lifestyle. Today for lunch he made a vegetable curry dish (with yellow onion, broccoli, peas, squash, zucchini and carrots) served over wild rice. Yummy! Our biggest share of the season! Greens like the kale and spinach are done for the year. The Swiss chard is full of bugs now too so I'm not sure if we'll get another harvest out of it or not. Meanwhile, the next batch of salad will be ready next week. Dill is also ready. And more parsley. The tomatoes are really on now and starting next week there should be enough for everyone on a weekly basis until it starts freezing at night. Broccoli and cauliflower are looking good right now! Last year these two crops were full of caterpillars! Disgustingly full of caterpillars. Shain used an organic spray this year to prevent a reocurence and it worked well because there were hardly any caterpillars when I washed the broccoli and cauliflower on Monday. Unfortunatley, life on the farm isn't that simple. Instead, the ear wigs are out of control. There were so many ear wigs in the cauliflower that I started collecting them in a bucket to feed to the chickens. For the rest of the day I felt like there were bugs crawling on me. 2012 is now the year of the ear wig so keep an eye out for them in the produce. I hate ear wigs! DIE!!! On a side note, I was commenting the other day that we haven't really seen that many grasshoppers this year. Some grasshoppers, but not like people warned us we'd see with all this warm weather. Shain told me he'd already used some organic control for grasshoppers. Either it wasn't a bad year for grasshoppes or the stuff he used works well too. Now, he says, it's time to find something we can use all over the farm for ear wigs. We have two openings in our EverGreen Farm workshare program. Unfortunately, two of our workshares are unable to continue with us for the remainder of the year (one moved and the other started a new job). Being a workshare is a great opportunity for people who love to eat great tasting, high quality, fresh, organic produce. Workshares receive a weekly CSA delivery of produce in exchange for their help on the farm one morning a week. There are usually a few extras to take home each week too. Come help us harvest, weed, or work on other projects for 4 to 5 hours per week. Then we take care of all the equipment, watering, constant care, and commitment to growing in this chanllening climate. As one workshare stated, "I couldn't grown this variety, quantitiy or quality of food on my own with only 4 to 5 hours work per week. Nevermind that I don't have the greenhouses or equipment." Another remarked, "I get all the benefits of growing a huge garden with very little input on my part." The specifics of our CSA and Workshare program are explained in detail in the following two documents. Tomatoes, only enough to send to Jackson this week. I picked the last peas from our first row of snap peas. Next week the shell peas should be ready. Yes! The tomatoes are ripening! There were only 26 pounds ready to pick this week which was just enough to send to Jackson. We will rotate tomatoes to the other pick up locations next week. Soon there will be enough for a nice sized bag for everyone. We are seeing the mid-summer transition of vegetable production the farm goes through each year. 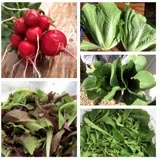 Some of the crops we've been enjoying for weeks (mostly the leafy greens) are nearly done for the season. In their place we will be harvesting head cabbage, peas, onions, and tomatoes. There are some broccoli and cauliflower heads on the plants. The red onions will be ready soon. The leeks look amazing! I am happy to report that we got all the garlic dug last Saturday. We had a great group of helpers come that morning and finished before noon! It is now bunched and hanging to dry in the shed. This curing process usually takes 2 weeks. Then we'll start cleaning it up to bag and distribute. This is a picture of greenhouse 4 that I took a few weeks ago. If you'll remember, greenhouse 4 is the last hoop house we built. We've planted in this area of the farm for many seasons (it was previously referred to as Field 1) but this is our first time using this ground as covered "greenhouse space". One great thing about greenhouses is that it gives us a defined space where we can concentrate our efforts for maximum vegetable production. As you can see, we've been able to keep up on the weeding here and it looks really good. We are currently in the middle of composting here as well. After that, we will start spreading a layer of mulch. Over time, rough and weedy areas of the farm are all getting a makeover. It's nice to see these improvements!